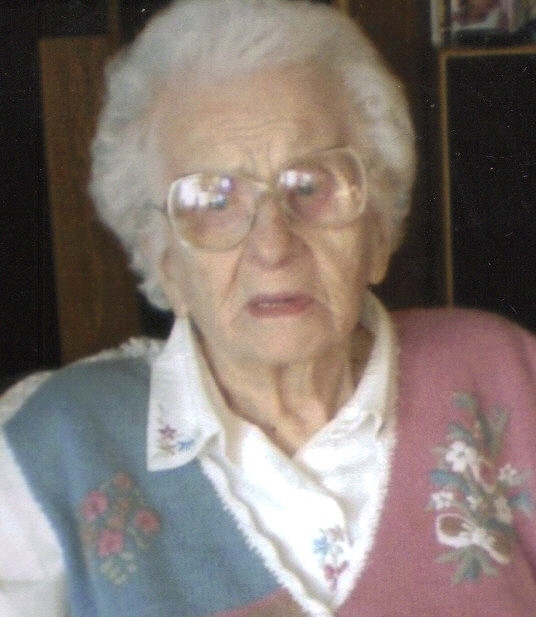 Gwendolyn (Gwen) A. Vander Woude, 99, died January 1, 2008 at Avera Prince of Peace Retirement Community in Sioux Falls. Gwen was born November 17, 1908 to William and Mary (McAreavey) Stevens in Humboldt, South Dakota. Gwen was the oldest of three girls. Her mother died at an early age from complications of the flu. Gwen was raised by her father with the help of aunts and uncles. She graduated from Humboldt High School and went to Teachers College in Madison, South Dakota where she received a teaching certificate. Gwen taught school for several years. She was united in marriage to William Vander Woude, Sr. on December 26, 1935. They lived on a farm near Ellis, South Dakota until their retirement in 1978 at which time they moved to an apartment in Sioux Falls in the Historical St. Joseph Cathedral area. William died in 1988. Gwen worked various jobs and was a superb cook and baker. She was a life long member of the St. Joseph Cathedral Club and the Catholic Daughters. She also spent many of her later active years as a volunteer for St. Vincent's DePaul store providing clothes for the needy. Gwen continued to live in the apartment until October of 2001 at which time she moved to Avera Prince of Peace Retirement Community and was a resident there until her death. Gwen is survived by three sons: Jim (Shirley) and their children, Mike, Kathy (Eric) Arndorfer and Patty (Todd) Altman; Tom (Mary Ellen) and their children, Fr. Tom, Steven (Erin), Bob (Melissa), Dan (Maryan), Pat (Jill), Chris (Katie), and Joseph; Bill, Jr. and his children, Jeff (Dori) and Jim (Kim); one daughter: Mary (Ken) Oehlke and their children, Karl (Kelley) and Heidi (Tarek) Mahrous, 14 grandchildren, 34 great-grandchildren and one sister: Lorraine Gordon of Dubuque, Iowa. She was preceded in death by her parents, her husband, one sister: Irene Dobbs; two brothers-in-law: Vince Dobbs and Marvin Gordon; and one granddaughter: Julie Vander Woude. Gwen's family is especially grateful to the Avera Prince of Peace Retirement Community staff for their wonderful care, kindness, concern, dedication and personal support given to Gwen during her many years as a resident there. The family has requested in lieu of flowers, memorials be directed to St. Joseph Cathedral and St. Vincent DePaul. Visitation will be Thursday, 4 pm at Barnett-Lewis Funeral Home with a Scripture Vigil at 7 pm followed by the Rosary. Mass of Christian Burial will be Friday, 10 am at St. Joseph Cathedral with burial to follow at St. Patrick's Cemetery in Montrose, South Dakota.